Prepare to dial up the resolution. In true Dark Souls spirit, two bells were ominously tolled before the game's much-anticipated PC release. 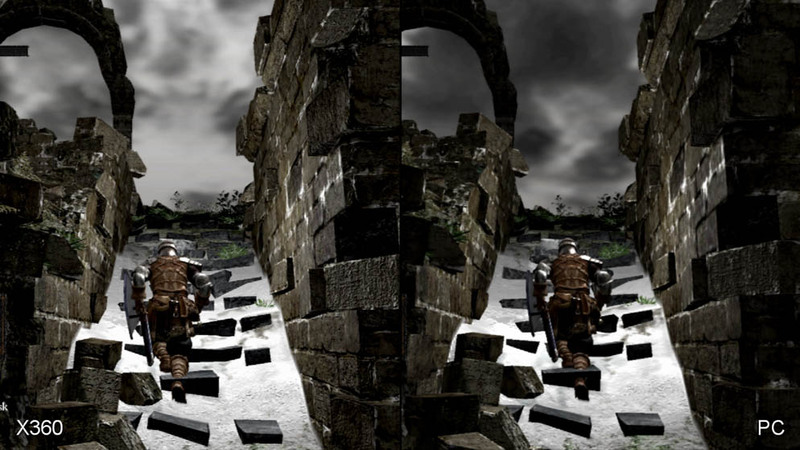 The first came via a Famitsu interview with series director Hidetaka Miyazaki, where it was inferred that the game would not be supporting the higher resolutions available on PC, and that there was absolutely no ambition within the team to improve on the visual quality seen in the console versions. Naturally, fans hoped the point on resolution in particular to be a translation mishap - a miswording, maybe - being as unlikely as it was for a high-profile PC game to ship with a fixed resolution. The second bell rang during a later interview with Eurogamer, where producer Daisuke Uchiyama admitted that optimising the game for PC was a process being met with limited success, and that it would strictly be an as-is duplication of the PS3 and 360 experience. That is, with all the frame-rate pitfalls as experienced before in boggy areas like Blight Town. Again, series enthusiasts reasoned that, in the worst case scenario, there would still be some manner of PC specification that would improve the game's performance over what we'd seen before, even if it involved an absurd expense. Having previewed the PC version during a lengthy gameplay session at Namco Bandai's offices, and also spending time with our own Steam version in recent days, the reality of the matter has became much clearer, however. The 1024x720 internal resolution we reported on earlier does indeed remain in fixed position here, while the 30FPS lock also stands - though hardly ideal, in practice the latter seems the least contentious point of the two. So we're certainly getting what we had bargained for in this sense, and the creative team has been quite true to its word. Before we address the impressive developments made by the online community, let's take a look at what this amounts to in the vanilla version of Dark Souls PC. Below we have a head-to-head video comparing exactly like-for-like footage of the game on PC and 360, slowed down to 33 per cent speed. As detailed in our Dark Souls Face-Off feature last year, the two console versions achieve a very close state of parity in terms of their visual make-up. "Out of the box, the final PC version of Dark Souls is mostly identical to the Xbox 360 game, complete with locked resolution and frame-rate. Thankfully, the res issue at least has now been resolved." The same holds true for this PC version, where all texture assets translate straight across with no bump in quality. Similarly, fog effects and alpha particles used when deflecting arrows with a shield remain the precise same resolution as before. For those keen to get an edge on the console versions, however, the game's graphical settings menu is quick to disappoint. We have options for resolutions leading all the way up to 1920x1200, plus toggles for anti-aliasing and motion blur which are already active on previous versions. From a close inspection of its resolution when set to 1080p, we can clearly count 24 steps from 45 pixels horizontally, and 30 from 45 vertically on high contrast edges. In effect, this gives us the same 1024x720 frame-buffer we had on consoles, and this rings true when they're placed side by side. Here we see the arches and tiling around the architecture of the Undead Asylum level blur over once they become too distant on either platform. The biggest difference we can prise out between the two is that of colour balance, where the PC code appears slightly darker, despite the brightness settings on each being set to five by default. This paints a bleak picture for image quality purists. However, within two hours of its official release we saw one NeoGAF member, going by the name Durante, valiantly come up with a fix to resolve the issues with resolution. By his accounts, the process involved running an "interceptor" script, written in anticipation of the game's launch, from which he was able to pinpoint a variable for adjusting the internal resolution. This is a quick, effective fix that deserves its praises; placing a D3D9 .dll file and a small customisable .ini in the game's main directory (labelled DATA) is all that's necessary to circumvent the resolution lock, and play the game at hugely improved levels of clarity. With this tested and working without any lock-ups, we simply had to call a rematch. By modifying the PC version we now see a rift in quality starting to form. The game's bleak fantasy aesthetic translates well. In particular, the cracks to wall textures around the asylum, and the metallic indents on the characters' armour now pop out, while the 360's upscaled output dulls these finer points over. The gnarled vines and eroded stonework around the Undead Parish are also great examples of From Software's attention to environmental detail and adherence to concept art, where the added clarity only flatters the hard work they've put in. These are very much the results we'd hoped to see when this PC version was first announced, so it's all at once gratifying and mystifying that it wasn't made possible by those who had the greatest powers to do so. It is worth noting that the in-game anti-aliasing option is not supported with the latest Alpha 0.3 version of the fix, but this is more than compensated for by running at a precise pixel-match for our monitor's resolution. For those looking to add AA, there are workarounds. The brute-force approach is to do it via super-sampling the image; essentially running the game at twice the resolution of your actual intended output. By changing the internal value in the .ini file to 3840x2160 while leaving the in-game option set to 1920x1080, we see a massive reduction in the stair-stepping on sharp-edged surfaces like swords and armour. It's an aggressive method that comes at huge processing costs on the GPU side, and those being bottle-necked by their graphics cards may find their games stuttering for minutes at a time. "A simple-to-install mod allows gamers to play Dark Souls on PC at whatever resolution they want, though only 16:9 aspect ratios are supported." 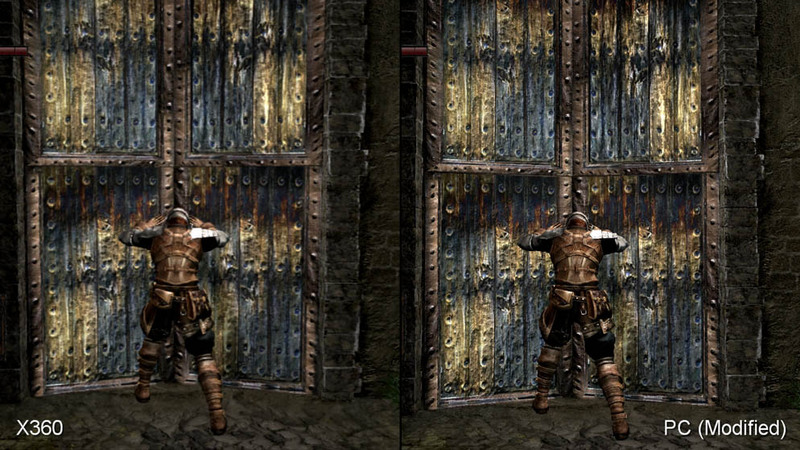 Here we compare 1080p shots of Dark Souls. On the left is the PC version with no alterations at all, while to the right we have the modified version using the resolution fix set to a native 1920x1080. Beneath the two is the output of the 360 version with the dashboard set to 1080p. Adding post-process anti-aliasing via the AMD or NVIDIA control panel is more feasible for most setups. 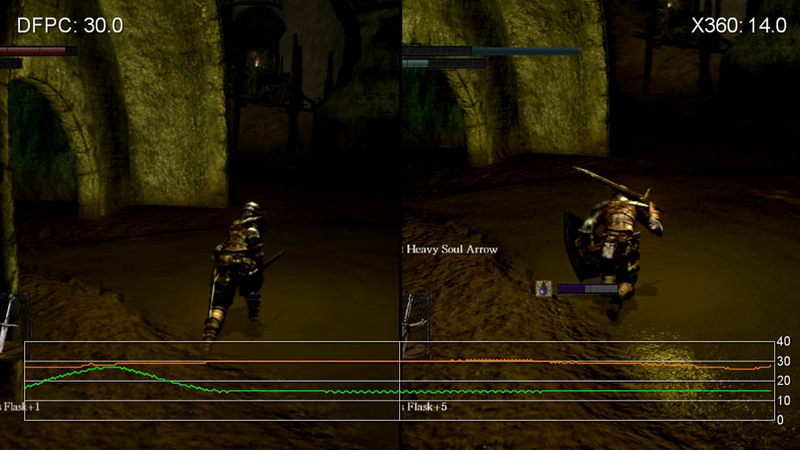 Be it FXAA or MLAA, we see Dark Souls' menu overlays lose some definition, but this is a cost-effective method of clearing up aliasing artifacts if it still grates after the resolution bump. In general though, the game's colour palette doesn't tend to allow for aggressive contrasts leading to aliasing; the game is entirely enjoyable without. 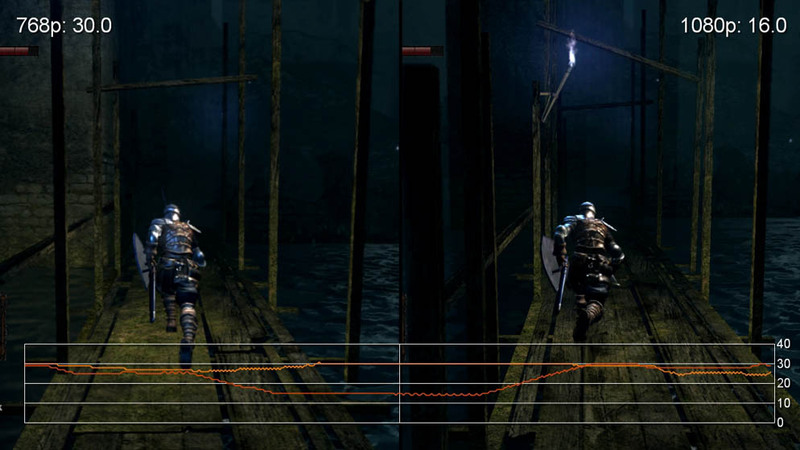 Dark Souls' PC Performance - Blighted By The Same Issues? With the resolution issue thankfully ticked off the to-do list, the next focus is on frame-rate. Here we're playing at a locked 30 frames per second, just as with the PS3 and 360 entries. Attempts to drive this up to 60FPS or beyond have so far failed to materialise, suggesting that this could be a much higher hurdle to jump by comparison to the resolution fix. Nevertheless, having a 30FPS lock does have certain benefits when playing games that aren't specifically optimised fully for a platform. During our preview session at Namco Bandai we had the opportunity to play the game on a supplied laptop, featuring an i7-2630QM processor clocked at 2GHz per core, 4GB of RAM, and a GTX 460M discrete graphics chip. These remain far from cutting edge specs in the portable space, and yet the laptop was able to play through areas such as Blight Town and New Londo Ruins with only a few hiccups. To see if From Software have any grounds to beat themselves up over the quality of their port, we test it out on our £300 Digital Foundry gaming PC first. The combination of a dual-core processor clocked at 2.8GHz processor and a HD 6770 gives it enough power to run many games directly translated from console, including recent releases such as Darksiders 2 and Sleeping Dogs. In these cases, the games have been optimised for CPUs with a comparable clock speeds, and generally slower GPUs, meaning playback at an 'HD ready' resolution of 1366x768 is usually the minimum we expect. "Dark Souls PC runs at the same locked 30FPS as the console versions, though the crushing performance issues in certain parts of the game can now be played with a fluid frame-rate." To give our budget configuration a good stress test, we run things both ways. On the one hand we see how the game plays in its standard state when outputting to 768p, where it's obvious there are still some occasional hitches down to 28FPS during cut-scenes. During boss battles, we're surprised to find these dips aren't amplified; the game sticks to its 30FPS agenda for the most part, with the exception being when the Taurus Demon lands next to you in a cloud of dust. On the other hand, modifying the game to allow for true 1080p comes with some caveats in performance. In areas such as Blight Town we see the frame-rate shuttle downwards to 15FPS for each resolution, though this hastily recovers to the 30FPS line on the 768p run. For the higher resolution though, we endure the drop for ten seconds in a matching spot, and the hiccups tend to come more frequently. In a sense, it's fortunate that a frame-rate cap is in place after all given the level of optimisation made here, and given that many PCs of a similar spec to this wouldn't be able to get close to 60FPS. We round out our tests by playing Dark Souls on our more flexible desktop build, factoring in a i5-2500k processor overclocked to 4.2GHz, and a Radeon HD 6870 graphics card. In this case we find stuttering is eradicated entirely, even when playing at the higher settings made available by the fix. The newer areas in the Artorias of the Abyss quest fare less favourably than those of the main game, however; once the Golem creatures in the Royal Woods start ganging up in full force, we notice our setup dropping the odd frame here and there. To put this performance boost into perspective, we pit the 360 version against PC in many of the same areas as before. Sustained drops to 10-15FPS are a common fixture when running through Blight Town on console, and so it's a relief to finally be able to see it in fluid motion on even our DFPC build. We refrain from modifying the game for these tests, instead choosing to simply output at 1366x768 via the in-game menus to ensure we're running at similar settings. "At standard settings, our the £300 Digital Foundry gaming PC provides a night and day difference compared to the console versions in Dark Souls' more troublesome areas." One point that often goes overlooked in the translation from console to PC is the benefit a faster hard drive can have to loading times. Dark Souls' predicates itself on dying over and over in order to grasp the dos and do-nots of its world and enemies, and as a result, a player inevitably becomes quite familiar with the loading screens they see in between. It hasn't been a particularly major issue on console, but the boost in speed we experience with the game installed to even a 7200RPM Seagate hard drive is welcome. Even before release, we took it on the basis of our early tests that the best way to play Dark Souls would be on PC, if only for the smoother frame-rate by comparison to console. Now that it's out in the wild, however, the improvements made by its fans have extended that lead by great measure. To name one already, the unlocking of the resolution already gives us a clearer window to view the game's well-crafted world, even if it does leave us wondering why From Software couldn't have achieved this of its own accord. This may only be the tip of the iceberg going forward for the mod scene, as eager fans will be scouring the game's codebase for ways to unlock the frame-rate, increase the field of view, or even add support for other aspect ratios - with 16:9 currently being the immovable default. The additions made to the package by From Software themselves have been meagre, but to its credit the game does run free of any visual glitches or random freezes we'd usually associate with ports achieved in a similar time-frame. Resolution and frame-rate locks aside, this does at least suggest that the team placed a priority on stability rather than frills; it's a solid foundation for its fans to build on. Even factoring in the odd performance hiccups we experience while playing on lower-end machines, the game feels respectably optimised for a range of hardware setups. Going forward, we'd be keen to see how far we can push the frame-rate if and when it's unlocked, but for now the experience feels palatable in its current state. Overall, as bare bones as it may be, the option to buy Dark Souls - and indeed future entries in the series - on PC can only be a good thing, even if it only turns out that they can meet us part of the way in delivery.